Peripatetic in arrival and swift and enigmatic in departure best characterizes the firm of Leake & Greene. Theodore H. Leake (b. 1859) was working as a “draughtsman” in Boston 1886 through 1888; in 1889 he and George Greene (1862-1935) established the decorating firm of Leake & Greene at 78 Boylston Street. Neither apparently had training in stained glass (both list their occupation during the next decade as interior decorators) and they soon hired glass artist Henry Hunt (1867-1951), recently arrived from London, who had learned the glass craft from his father. 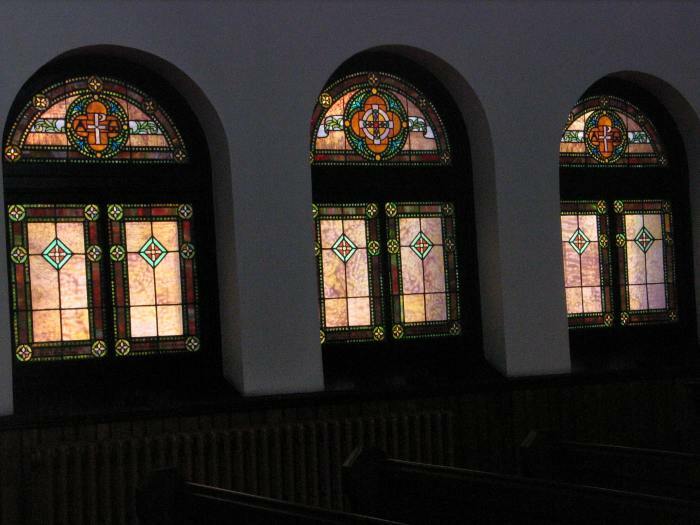 Leake & Greene’s earliest documented surviving windows are in Hawthorne Avenue Presbyterian Church, which opened in 1896 in Crafton, Pa., four miles southwest of Pittsburgh. The windows, commissioned August 3, 1895, are simple yet colorful windows, with floral decoration and Gothic columns framing a cross-and-crown motif. Such simplicity is often found in Presbyterian church windows of that period. Intriguingly, the Hawthorne windows resemble to a degree the aisle windows in H. H. Richardson’s Emmanuel Episcopal Church (1884-86), which probably date from the 1890s. Frank Alden supervised construction of Emmanuel and designed its parish house in 1887. In 1897, Alden & Harlow added three bathrooms to Henry Clay Frick’s home Clayton and two buildings on the grounds. Leake & Greene designed the glass. 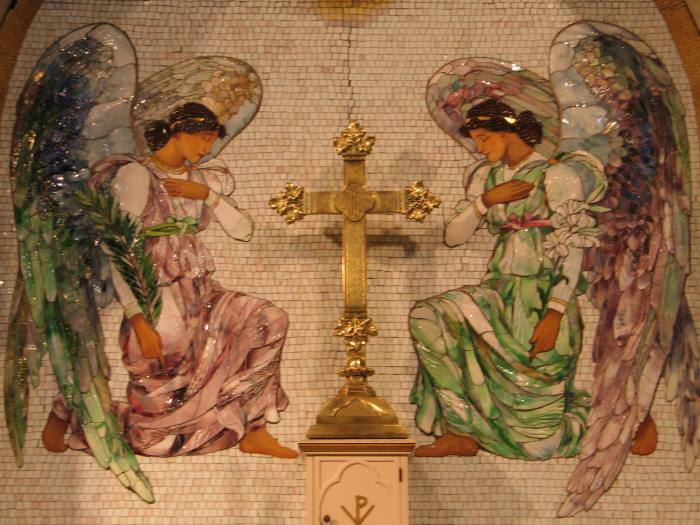 Emmanuel Church is the site of Henry Hunt’s finest known work for Leake & Greene, the Thaw Memorial reredos of 1898, an Italian Romanesque tour-de-force in glass mosaic, with decorative metal and stonework supplied by Richardson’s master carver, John Evans of Boston. The cartoon was exhibited at the first architectural exhibition held in Pittsburgh in 1898, and a section, “Adoring Angels,” illustrated in the catalog. Leake & Greene also exhibited five other Pittsburgh projects, including a stair window for Alden & Harlow’s Jennings residence and a nave window (not executed) for the Church of the Ascension, designed by the late William Halsey Wood, but constructed by Alden & Harlow. Leake & Greene did not participate in the next two architectural exhibitions, but they were a strong presence in the third exhibition, held in 1905. In addition to windows for Alden & Harlow’s Armstrong residence and the chapel at St. Margaret’s Hospital in Pittsburgh (both gone) and Trinity Episcopal Church, Bellevue, Pa. (current status unknown), the majority of the commissions were for sites in New York state. The firm is last listed in Pittsburgh city directories in 1906. That year Hunt established his own firm (still in business as Hunt Stained Glass Studios). Leake & Greene exhibited glass at the Architectural League of New York, February 4-24, 1906, but their entry, “St. John and St. Paul,” was designed by New York artist Tabor Sears. 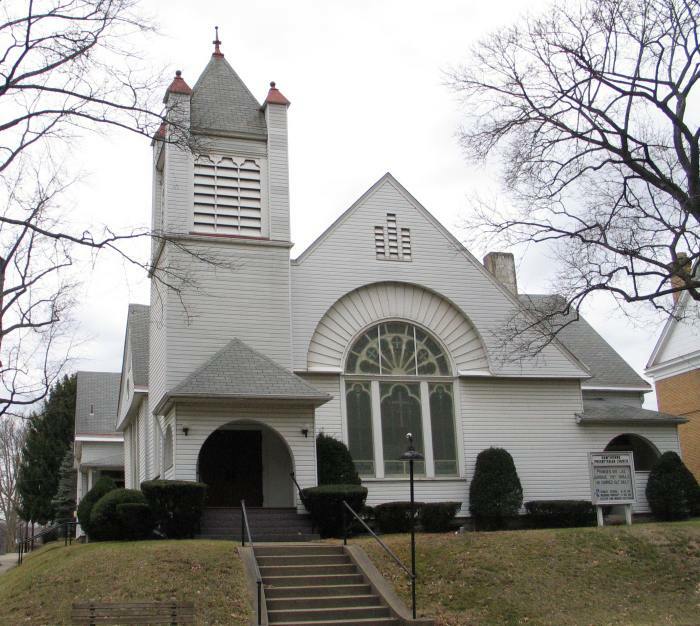 The firm’s last documented Pittsburgh commission, awarded February 8, 1906, was the glass in Greenstone United Methodist Church, Avalon, Pa., designed by architects Vrydaugh & Wolfe. By 1910 Greene had married and listed his occupation as stained glass artist. Leake still called himself a decorator. For a time, Leake and George and Leonora Greene shared the Church Lane residence. 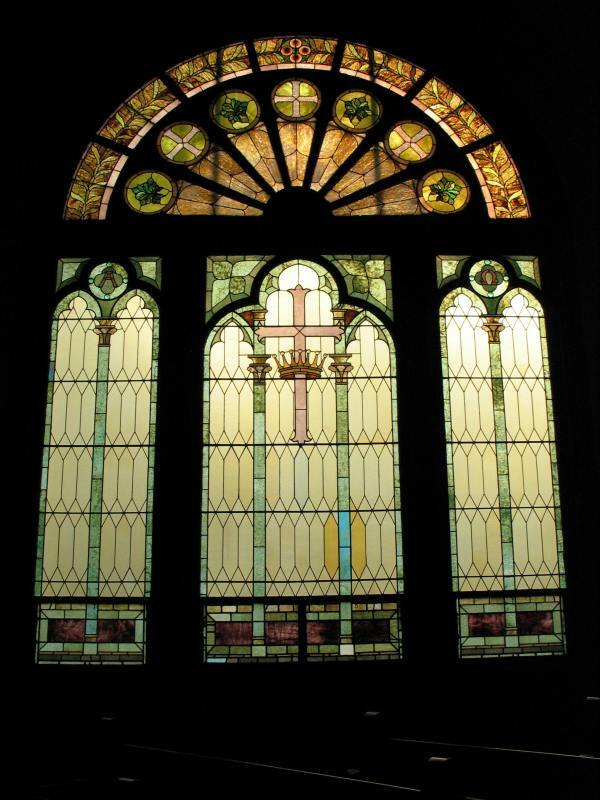 Leake drops from view and Greene continued to work in stained glass; in 1923 he designed a window for the Homewood Cemetery chapel, fabricated by Rudy Brothers. Green (he dropped the “e”) was living on Church Lane, sans wife, at the time of his death in 1935. Nothing is currently known about A. C. Boyd and J. A. Long, the architects of Hawthorne Presbyterian Church. They only appear in the 1895 Pittsburgh city directory. Sources: Hawthorne Presbyterian Church of Crafton, Pa., Minutes, Inception 1894-May 1901. “George Green.” [sic] Sewickley Herald, 13 December 1935. Henry Hunt, “The Autobiography of Henry Hunt,” Stained Glass 36 (Winter 1941): 118-122. Albert M. Tannler, “A Visit to Boston,” PHLF News 163 (February 2003): 14-15. Information and documentation from Marilyn Evert, Homewood Cemetery. Additional information from Mary Beth Pastorius and Kirk Weaver. Hawthorne Presbyterian Church, Crafton, Pa.